Trivias and quiz icebreakers set the stage for a relaxing gathering with friends and family. They are no fuss, no mess fun. Trivias have gained popularity over the years, becoming the basis for many quiz shows and party games. Below are quizzes geared to specific topics...everything from art to weddings. 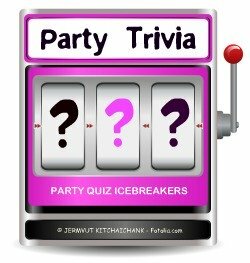 Use them as they are for party icebreakers or mix them together for an all out trivia party. Name That Christmas Movie challenges your ability to decipher the titles of popular Christmas movies from synonymous phrases. Similarly our Christmas Carol Game offers the same challenge only this time with popular Christmas carols. Finally, Name That Carol requires you to guess carols based on a short phrases from each song. If you're planning a spa party for a bridal shower or girls get together, try adding our spa quiz and if you'll be sipping cocktails try our new Guess the Cocktail Names game too. Unique Animal Trivia Game Image Challenge - Can you guess the animal from a small sample image of their fur? Get this free printable game, plus 4 additional games by subscribing to Party Fun Magazine! Art Quiz - 26 multiple choice questions about artists and their tools. Take this quiz not only to test your knowledge of art, but to be inspired by the creativity that surrounds you. Baby Trivia - Perfect for a baby shower, but oh so fun for testing a new father-to-be also. Why not start a friendly wager before asking the dad-to-be these questions. This baby trivia would also be great for a mom's group, mother's day event, or just for fun. Barbie Quiz - An interesting multiple choice quiz about that famous doll every girl had to have. Beauty Quiz - You just might learn something with this trivia. Great questions about cosmetics and the beauty industry. How much do you really know? Camping - How much do you know about spending time in the great outdoors and protecting yourself from the elements? Test yourself with this fun and easy multiple choice quiz. Cape Town South Africa Quiz - Test your knowledge of beautiful Cape Town, South Africa. Use this quiz at a travel themed party or for a fun geography class activity. Christmas Multiple Choice - Everything from Santa to eggnog is included in this yuletide quiz. Use it as an icebreaker or tie breaker at your Christmas events. Craft Quiz - A great icebreaker for a craft party or women's group. It includes questions on a wide variety of arts and crafts. Democrat or Republican - Determine what political party is associated with each fact. Dictionary Game - A multiple choice, fun with words dictionary word quiz, using obscure words to test your knowledge of the English language. The words could also be used for a game of balderdash. Dog Quiz - A fun and informative quiz to test how much you know about man's best friend. Exercise Trivia - A multiple choice exercise quiz to test your knowledge of general fitness strategies. Use it as an icebreaker for an exercise and healthy living class or mix the questions with some of our others for a trivia party. Fun with Food - a multiple choice quiz on a variety of foods. Great for a kitchen party, bridal shower, or trivia party. Fun with Words Game - Guess the meanings of words from 4 possible choices. Green Trivia - Questions about all things green. Use it for any party or event. It's especially perfect for a St. Patrick's Day party. Guy Fawkes Quiz - consists of questions related to the infamous man behind the failed Gun Powder Plot in England in 1605. Horror Movie Trivia - Match the horror movie characters to the clues that describe them. Maui Quiz - If you've travelled to the island of Maui or if you're in the know about the Hawaiian islands, try this fun quiz. It also has links to two other Maui quizzes. Try them at your next Hawaiian Luau Party. Michael Jackson Game - A multiple choice question and answer game on the life and accomplishments of the King of Pop. Model Trivia - A fun multiple-choice quiz highlighting the lives, loves, and careers of our favorite supermodels. Perfect for a celebrity, fashion, or beauty party. Movie Trivia for Teens & Tweens - Multiple choice questions about the movies... Ice Age, Legally Blonde, Bambi, Monster's Inc., The Pacifier, and Phantom of the Opera. Oscar Trivia - a multiple choice quiz on the most celebrated movies of yesterday and today. Pirates of the Caribbean - This Pirates of the Caribbean quiz will test your knowledge of the cast and how much attention you paid to the little details of the movie. Presidential Question Game - a quiz about the American Presidents ranging from pets to accomplishments. Pub Night Trivia Variety Quiz - a free mini pub quiz, plus 4 additional printable games available for subscribing to Party Fun Magazine! Questions include categories like "That's So Punny," "Name That Sitcom," and "The Body Shop." Red Trivia - A quiz based on the color red. Perfect for a Valentine party. School Trivia - This multiple choice quiz includes a variety of questions ranging from movies set in a school environment to essential school supplies. Let It Snow - What do you know about the cool fluffy stuff that Bing Crosby dreamed about in the movie "I'm Dreaming of a White Christmas?" It makes a great icebreaker for a snow party. Super Bowl Quiz - Challenging multiple choice questions based on one of the most celebrated annual sports events in North America. More Super Bowl Questions for football and sports nights. Tea Questionnaire - A fun tea party game that quizzes participants on that delicious, healthy beverage we call tea. TV and Movie - Do you remember Gilligan's Island and the A T-Team? Do you keep up to date with the new shows like American Idol? Find out what you actually do remember with this TV and Movie multiple choice quiz. Valentine Quiz - A multiple choice quiz based on the history of Valentine's Day, plus events, people, and things associated with this romantic day. Wedding Trivia - The perfect multiple choice quiz for a bridal shower or a wedding. It includes a wide variety of wedding related questions that make it both entertaining and informative.